…Within the multiple layers of American society, and under the radar of mainstream media, there are shifting secret alliances among and between covert governmental, corporate, military and criminal gangs with partially overlapping conspiracies and agendas – but all concerned with enhancing the wealth and power of their particular ìspecial interestî groups. It is significant that Jean Eisenhower’s journey through the murky, paranormal shadowlands begins when she, the idealistic young former minister’s wife, is working as a media activist for a radical environmental group, “Earth First!,” advocating for sustainable forestry, a group which is being violently attacked and simultaneously framed by rogue law enforcement entities allied with timber industry interests. She finds herself under surveillance and subject to weird and terrifying altered states with obvious hostile intent, that challenge her idealism, her worldview, her religious convictions and ultimately her sanity. In her ten-year odyssey through the psychic undergrounds, she encounters experiential evidence of the secret government mind-control experiments known as PSY-OPS and MK-ULTRA…. Jean Eisenhower brings the fierce intelligence of a spiritual warrior to her quest, as she seeks to sort out what is her own personal traumatic story of growing up in a disturbed family system, and what has deeper connections to covert military and alien abduction operations. 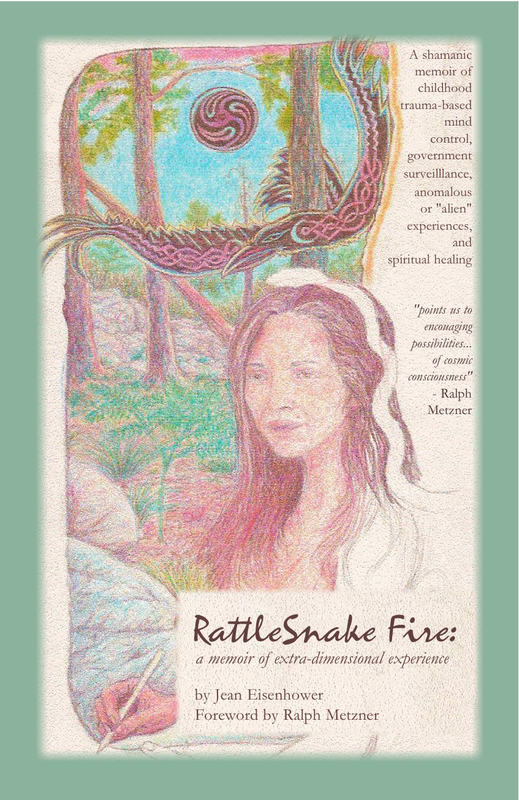 Her shamanic experiences of connecting with the spirits of trees and of animals that manifest both physically and psychically provide her with solace and healing knowledge. She learns methods to access intuitive insight and understanding.